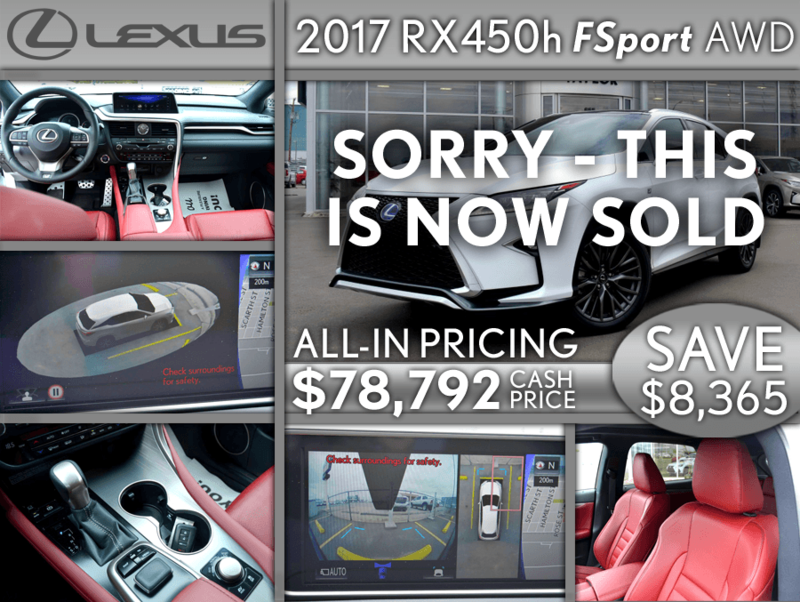 RX450h FSport (Hybrid) @ Taylor Lexus Regina Lexus Dealer SK. SORRY, THIS UNIT HAS BEEN SOLD. PLEASE SEE OUR NEW INVENTORY OR NEW SPECIALS FOR OTHER OFFERS. Experience the luxury, performance and impressive fuel economy of Canada’s most fuel-efficient mid-sized SUV! – according to the Canadian federal government. -15 speaker Mark Levison sound system 7.1 channel full HD surround sound incredible clarity with only 0.1% distortion. -Drive Mode Select – with Eco and Sport mode. Save on gas or drive with more vigor – as well a Sport Plus Mode that gives you the ultimate level of control & performance while you drive. This vehicle wont last long save thousand from new on this beautifull maintained executive driven Lexus with approximately 9,500km’s on the odometer.